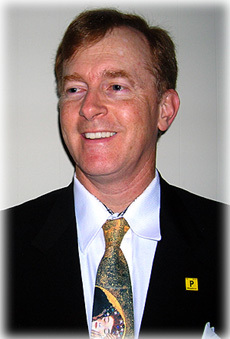 Preston MacDougall is a chemistry professor at Middle Tennessee State University. His "Chemical Eye" commentaries are also featured in the Arts and Public Affairs portion of the Nashville/Murfreesboro NPR station WMOT (www.wmot.org). Chemical Eye on Seeds of Genius - What can brown do for chemistry? Chemical Eye on the Web-Wired World - From me to you, Happy New Year! Chemical Eye on Rank Magazines - Read this! Knowledge is solving problems no one else can. Expand your knowledge and get a degree in less than 2 weeks - no study required. 100% verifiable B.S., M.S., and Ph.D. diplomas! Call now 1-206-984-2822, 24 hours a day, 7 days a week. Chemical Eye on Paths of Glory - Patriotism is the last refuge of a scoundrel. Chemical Eye on a Nuclear Earth Day - Thank goodness for global warming, otherwise I am pretty sure Hell would have frozen over recently. All those demons would have to go somewhere, and if you've seen any of the Ghostbusters movies - "Not good." - More..
Chemical Eye on Easter Eggs - Build it and they will come. Chemical Eye on the Atomic Deficit - The first rule of holes is: If you are in one, stop digging. Chemical Eye on a Sweet Thang - "How sweet it is?" Chemical Eye on Snapdragons by Candlelight - "If you play with fire, you will get burned." That's what my father told me, and it's what I have told all of my children. Except for recently, when my finger was on fire and I told my son "If you watch a trained chemist play with fire, you will get learned." - More..
Chemical Eye on Blue 'n Gold - "My ???? girl. Hey my ???? girl." Chemical Eye on the para-Scopes Trial - Eighty years ago, Tennessee science teacher and football coach (surprise, surprise), John T. Scopes, was found guilty of teaching evolution in a high school biology class. At the time, this was illegal under state law. His conviction was overturned, however, because his $100 fine was double the limit on fines that Tennessee judges could impose. - More..
Chemical Eye on the City of Dreams - "Good morning America how are you?" Chemical Eye on Superheroes vs. Superbugs - Disbelief. Anger. Derision. But ultimately pity. Chemical Eye on Winds of Change - So, what's new with you? Chemical Eye on a Time Warp - There is no such thing as a time machine, and we can be pretty sure that there never will be. Otherwise, we would have met at least one bona fide tourist from the future by now. Chemical Eye on Jazz89 - Solid. Solid. Solid. Chemical Eye on a Greener Environment - Just ask Kermit the Frog, it's not easy being green. Chemical Eye on a Hydrogen Bomber - "Are we there yet?"